The right foods, (lots of) water, activity, and light — both natural and electric — can all aid in helping us stay awake when we're feeling a bit listless. When your eyelids start to grow heavy, try one of these tips. From staying well hydrated to feeling the beat, you can totally regain your pep. We've all heard of the "sugar crash," where fatigue sets in after we've had a good dose of simple carbs in the form of soda, candy, chips, a plate of pasta, etc. Foods with high sugar content provide a fleeting "high," only to be followed by a low in which our bodies feel tired and/or sleepy. The body breaks down carbs into sugars, and simple carbs are quicker to break down than complex ones, resulting in a quick burst of energy. The rise in blood sugar levels, however, also triggers the pancreas to produce insulin, which consequently "prompts cells to absorb blood sugar for energy or storage." As a result, your blood sugar levels get zapped and you start to quickly come down from that high. Complex carbs on the other hand, such as whole wheat bread and whole grain pasta, take longer to break down, thereby providing a more balanced energy boost. While you don't get the immediate high, you also don't experience the subsequent crash. So choose the right foods for that working lunch or afternoon snack. Note: Fruits and vegetables are simple carbs, but act like complex ones (one exception is potatoes). So that apple is a good choice (the baked potato not so much). Sitting in one place for too long can lead to fatigue, though varying your tasks can help. Sitting still though can convince your body it's time for sleep and affect your circadian rhythm, that 24-hour endogenous cycle that helps set our sleep-wake patterns. To reverse tiredness here, simply get up and move about. Walk around the bullpen or to the break room for a cup of water or do a set of jumping jacks or pushups in the hallway. For the exercises, you won't look silly. It will be clear to everyone what you're doing, and you may just start a trend. CSULB professor of psychology Robert Thayer, author of Calm Energy: How People Regulate Mood with Food and Exercise, found in a study of 37 individuals that "there was a clear and strong relationship between the number of steps they took and their overall mood and energy level." Those in the study kept track of their steps with a pedometer, an investment you may want to make as well to keep a running total of what your ideal step count is (and perhaps set a personal goal to best it each time). You can also combine your walk with a breath of fresh air outside. Walking to your lunch destination and eating in the courtyard, at the nearby fountain, or corner cafe will also help you raise your energy level. The sunlight will not only revive you in the here and now but also aid in keeping your internal clock in check. Your body also needs water. Fatigue is a common symptom of dehydration and you should never let yourself get to the point to where you're "thirsty." Regulate this by taking sips throughout the day, which may lead to more breaks for the bathroom, but that will also tie into moving about. A Tufts University study found that dehydration in athletes "was associated with a negative mood, including fatigue and confusion." Those who are stationed at a desk also run the risk of becoming dehydrated, as it's easy enough to become too busy to remember to drink proper amounts of water or other liquids, such as fruit juice, coffee, iced tea, etc. Remember, sufficient fluids in your body help the blood get to your organs. Note: You can also get your water through foods, such as fruits and vegetables. During the summertime, a slice of watermelon is a perfectly refreshing snack that's a complex carb and a great source of water. So food, exercise, sunlight, and water. 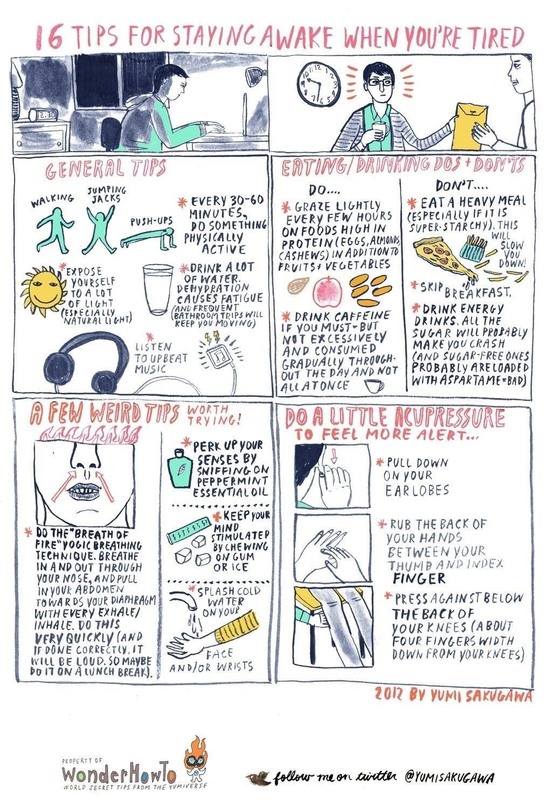 If you've already tried these tips before, however, and you're still feeling a bit low, try some more singular tactics, such as yogic breathing techniques, sniffing peppermint essential oil, or some basic accupressure at your desk to help clear the sleep fog in your brain. It all circles back to our bodies and how we can be more mindful of what they need. If you're in otherwise fine health, you can easily take steps to counter tiredness. Also, understanding why you're feeling tired will help in staving off low energy: Be proactive and head off fatigue before it can take over. Fascinating. Where did you hear that? Trying this as I type. Really helping. Working on an essay for tomorrow. I am so tired, dang it... Really cool drawings!! VERY USEFUL, IM VERY THANKFUL!!!!! What if your tired and you have school tomorrow? Getting stabbed in the knee works, but is highly dangerous. It would be safer to use these tricks instead. Thank you! I just had to pull an all nighter to finish a load of school work and these tips were really helpful. Fresh air and sunlight always helps to physically and mentally function better when you are tired. For this reason, get outside in the open air, take some big breaths and make sure that you expose yourself in the sunlight. Sunlight gives you Vitamin D which increases your energy levels. If there is no sun, then try to get sun bright light indoors. Breathing must be done properly to increase your energy and decrease your stress. Give some time to your breathing as if you are doing Yoga. Try inhaling while you count from 1 to 5 and again try to exhale while you count from 1 to 5. I like the illustrations. If the temperature in the house is cool then don't stay near a blanket. It's very difficult to fall asleep when you're cold.